Illustration of a girl smoking a cigarette. 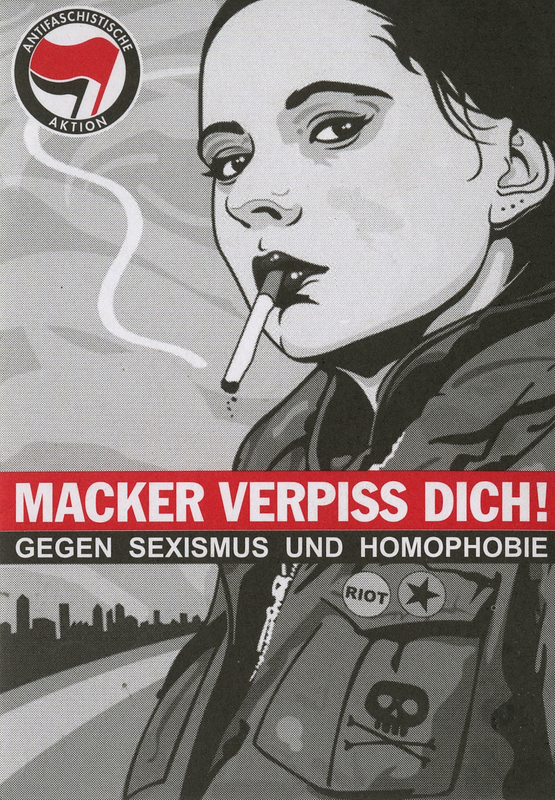 The upper left hand corner includes the red and black flags logo for Antifaschistische Aktion, a German organization whose goal is to smash fascism in all forms. Referencing the “triple oppression” theory, its members seek to eradicate sexism, racism and classism. The woman represented on the sticker subverts traditional understandings of femininity. She looks down on the viewer, a lit cigarette dangling from her lips. Her military-style army coat features riot pins and a skull and crossbones.